So, somehow I ended up being in charge of our fundraising efforts for our class, so I had sweatshirts and t shirts made. Apparantly, I am also the sole individual responsible for actually getting them sold! We've done ok with selling them to our class, but that's about it. Some people feel the sweatshirts are a little overpriced, but they are in fact less than any sold by the university, and the same price that previous classes have sold them for. Anyway, just thought if anyone would be interested in purchasing any, or know anyone wh might be, I can send them to you. Unfortunately we don't have good images of how they look (but I'll tell you, they do look pretty good; I've bought several myself). 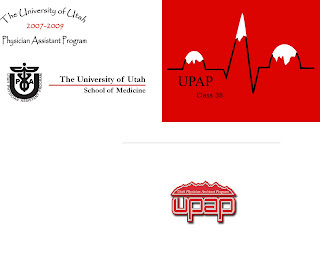 The t-shirts come in a dark red or dark charcoal grey, and the front design is the "the university of utah physican assistant program 2007-2009" logo centered (upper left design below), and the backis the EKG/mountain logo (upper right, below). The hoodies are very warm and fuzzy, and come in lovely dark heather grey or red. The front logo is the school of medicine logo (bottom left below), with the UPAP logo on back (bottom right below). Hoodies: $40 each, Tshirts: $20 each, supporting your favorite hard working PA student and getting it delivered to your home: priceless.